boAt Rockerz 265 Sports Wireless earphones comes with an amazing commixture of style with performance that’ll make your listening experience personal & for real. Their Signature Sound Processing will generate one of the greatest sound experience you could get from an earphone. The powerful 10mm dynamic drivers & Premium Chipset produces ample amount of sound, & harmonizes every possible note enabling the earphones to deliver an energetic, powerful & inspirational sound while keeping the bass level high so that all your focus is shifted towards your workout session and your concentration is more intense keeping your spirits up. Created for comfort & to compliment your lifestyle, the boAt Rockerz 265 utilizes a gleaming housing & an in-ear design to create a seal between the ear tips & your ear canal, providing a locked-in, comfortable, noise-isolating in-ear fit for any activity while delivering clear and dynamic sound. Rockerz 265 embodies ultimate durability, the light weighted design, & the Over-ear Memory Wire shapes around the ear for a comfortable, secure, maximizing fit & stability for your most intense workouts. boAt Rockerz 265 can be paired with two phones or two Bluetooth devices at the same time. When it’s playing music from your laptop and your cell phone starts ringing, the music is automatically paused, and the headset channels the cell phone calls seamlessly. 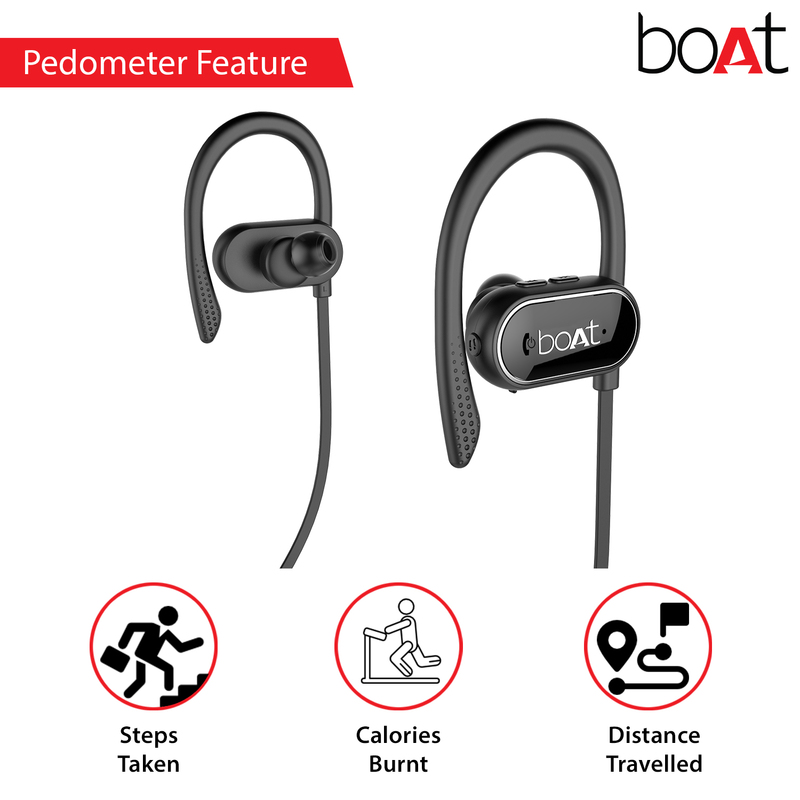 The boAt Rockerz 265 is ergonomically designed to allow in a certain amount of ambient noise so you’re aware of your surroundings during active use. One can keep record of your fitness activity & get notified instantly with in-built pedometer readings. It’s smart enough to tell you exactly how many calories you have burnt and the distance you have covered. The boAt Rockerz 265 provides Bluetooth 4.1which increases battery life dramatically while letting you travel further. Bluetooth 4.1 allows specify the reconnection timeout intervals for their devices. Advance Audio Distribution profile (A2DP V1.2) will stream you high quality music intact and Audio/Video Remote Control Profile (AVRCP V1.4) is designed to provide a standard interface to control your device. The 120Mah rechargeable Li-Polymer battery delivers up to 7-8 hours of audio excellence. From music, to movies, videos and so much more, it’s all in a day’s work for the boAt Rockerz 265 wireless earphones. You can get a full charge in just 1.5 hours with the included USB cable and just 20 minutes of charging will give you another 1-2 hours of run time, giving you endless enjoyment. The boAt Rockerz 265 wireless Earphones can be charged via micro USB. The ergonomic design & secure fit will prevent it falling off too. IPX4 rated, combined with the lab-tested sweat- and water-resistant design allows you to be carefree about your earphones & builds more concentration. boAt Rockerz 265 is engineered impeccably to give you the utmost user experience ever. Its dynamic drivers pack a punch of true bass like no other, delivering a rhythmic response to even the most demanding tracks. It provides a deep, mellow, powerful sound and everything else is so placid & soothing that every note sounds clearly significant. The price of the product is 3490 INR. The product carry’s a 1 year warranty and is available at Amazon.in at an introductory price of 1999 INR.